Just turned 17 and looking to learn to drive and take driving lessons in South West London in order to secure a driving licence for the first time? Tried driving before but gave up and are now looking to give it another go with a new driving instructor in South West London? Or do you have a licence but are new to driving in this part of town and looking for some refresher lessons? Perhaps you are an experienced driver from overseas simply looking to pass the driving test and obtain a UK driving licence in South West London through driving tuition tailored for driving tests in the area? Or you are looking for Automatic driving lessons in South West London? Do you specifically require a female driving instructor in South West London? Need to pass the driving test within a short period of time for work or travel reasons and are looking for an intensive driving course in South West London? Maybe you are looking for specialist driver training in South West London in order to build on your existing experience through focused city, motorway or rural driver training or maybe a Driving Standards Agency 'Pass Plus' qualification? Whatever your needs, Chelsea Driving School is a motoring school in South West London which specialises in offering tailored driving lessons in order to suit you. With driving instructors available in all areas of South West London who are fully qualified. This means that some of our instructors are the best in the business and actually teach other driving instructors how to provide the basic lessons that most driving schools offer! All of our instructors are continually mentored and tested by our Grade A instructors and you will take mock tests with our 'Grade A's' (on request) in order to ensure that you are fully ready for your test when the time comes and don't waste your time or money. So if you are looking to learn from some of the most highly skilled driving instructors in London and benefit from their experience directly then Chelsea Driving School is for you. All of our instructors teach in a friendly, supportive, encouraging style and are experts in designing a bespoke learning experience to suit how you will benefit most from your hours behind the wheel. 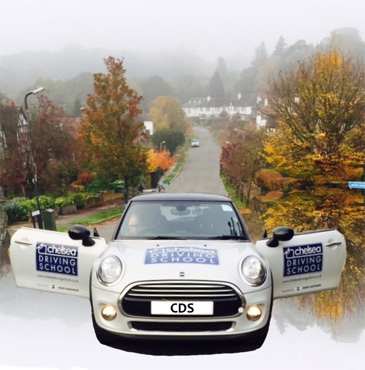 Please see our 'Courses' page for more details of the different types of driving lessons in Chelsea and the surrounding areas we offer and our 'About Us' page to learn more about how we operate differently from other driving schools in the area. We understand that every persons needs are different. Get in touch through any of the plethora of ways available (including 'Contact us' here) and we promise you will be dealing with one of our dedicated, friendly employees committed to making sure you receive the best customer service available - no outsourced call centres or centralised booking here! We were so sorry to hear that our longest serving and highly regarded Instructor ANDY was moving to Sussex that we decided to partly move with him! We are glad to announce that we will now be covering areas in EAST SUSSEX. Our loyalty to a GREAT INSTRUCTOR. Please note that 'prices' differ in Sussex. See our 'Areas' page for more detail on all the areas of South West London that we cover but you can learn to drive, take driving lessons in, pass your driving test and get a driving licence in Balham, Barnes, Barons Court, Battersea, Bayswater, Belgravia, Belmont, Brixton, Cheam, Chelsea, Chiswick, Clapham, Cobham, Colliers Wood, Earls Court, Earlsfield, Eastbourne, East Sheen, EAST SUSSEX, Epson, Esher, Fulham, Gloucester Road, Hampton, Hersham, High Street Kensington, Holland Park, Kingston, Knightsbridge, Lancaster Gate, Mayfair, Merton, Mitcham, Morden, New Malden, Notting Hill, Oxshott, Parsons Green, Pimlico, Putney, Queens Gate, Queensway, Raynes Park, Richmond, Roehampton, Royal Tunbridge Wells, Sheen, Southfields, South Kensington, South Wimbledon, Stockwell, Streatham, Surbiton, Sutton, Teddington, Tooting, Twickenham, Vauxhall, Victoria, Wandsworth, West Brompton, Weybridge, Wimbledon, Wimbledon Park and Wimbledon Village with us. We will travel to pick you up and drop you off from any location in these areas for free. There is no extra charge for evenings or weekends. If you are interested in becoming a driving instructor please see our 'Instructor Training' page for details. If you are an exceptional, qualified driving instructor looking to join a new growing driving school franchise who does things a little differently in South West London then please see our 'Driving School Franchise' page.